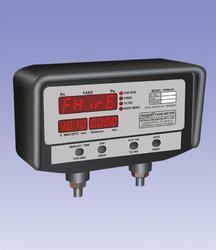 Our range of products include pfm - 102 taxi & rickshaw fare meter with flag and pfm - 101 taxi & rickshaw fare meter without flag. Highly compact, attractive looking and sturdy. Separate display fields for Fare, Waiting Time and Distance travelled. Indication to show current mode of operation(For Hire/ Hired/ To Pay). 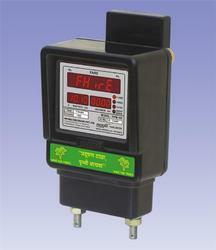 Time to show on WAIT/RTC display when the meter is in FOR HIRE mode. Buzzer indication while changing the mode or while updating the fare. Indication at the backside of meter for indicating whether the vehicle is hired or available for hiring. Memory recall gives the details of last trip. Available is ABS as well as Aluminium body. 24 col dot matrix/Thermal Printer.